Mid-century modern design and traditional Persian craftsmanship meet in this striking earring set. Worlds collide in Puja Bhargava Kamath's old-meets-new design, which takes inspiration both from mid-century modern style—see the geometric pattern—and a traditional Persian handicraft called Bidri. 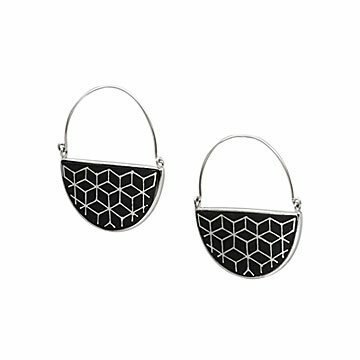 Expert artisans in Bidar, India, set to work on each pair, inlaying sterling silver wire onto oxidized, blackened zinc half moons. Each set is like a work of art—and the best part? You can wear it. Handmade in India. 1.5" L x .8" W Full Drop: 1.8"